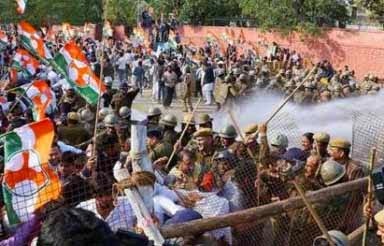 New Delhi : The Indian National Congress showdown the NDA rule Central Govt for Land Acquisition Ordinance, and took a violent turn after Delhi Police resorted to the use of water cannons and a baton charge on participants to prevent them from reaching Parliament. Youth Congress workers led by MPs Anand Sharma, Ghulam Nabi Azad and other party leaders marched towards parliament raising slogans against the bill and the central government. Among the Congress leaders protesting the bill were former union ministers Anand Sharma, Ambika Soni, Sachin Pilot and Kumari Selja. Congress president Rahul Gandhi was not present at the protest. Some of the protesters climbed atop the barricades and waved party flags. They also indulged in sloganeering. Policemen in riot gear used water cannons and batons to force the crowd to retreat while some were detained as well. "The BJP is anti-farmer and it stands exposed today... farmers and the Congress will win this fight," said party leader Randeep Surjewala. Azad said: "The BJP has been a party of capitalists. They are not at all concerned for the welfare of the farmers." Another party leader Sachin Pilot said: "The BJP is the same party that had proposed changes in the land acquisition bill but today they are opposing (the changes) them." The contentious land bill has sailed smoothly through the Lok Sabha due to the NDA's majority, but the government is facing stiff resistance in the Rajya Sabha where it lacks the numbers, with the opposition determined to stall its passage.